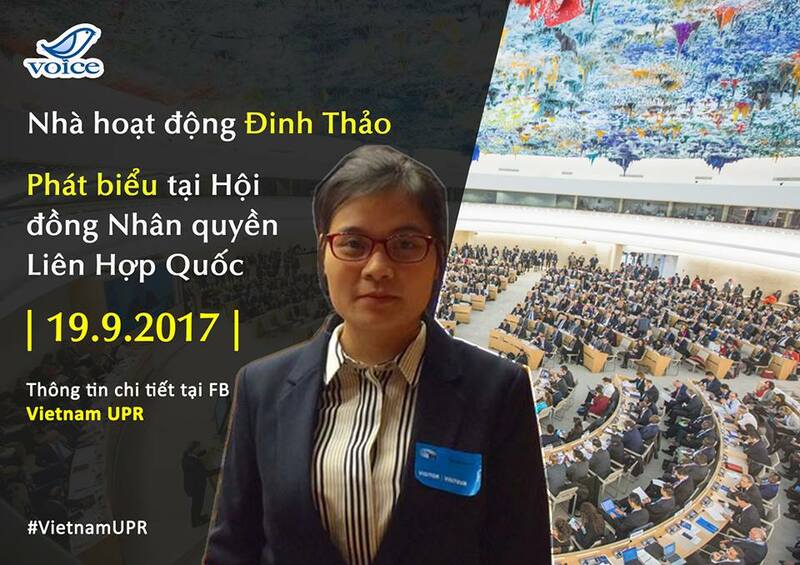 Let’s listen to our statement before the United Nations’ Human Rights Council today, delivered by Đinh Thảo, one of our delegates, a staff of VOICE. We are proud to bring voices of conscience from #Vietnam to the international community’s attention. We are gravely concerned by the crackdown on human rights defenders in Vietnam. Despite its international treaty obligations and recommendations accepted at the UPR to respect freedom of expression and civil society space, the Government of Vietnam is doing the exact opposite. In the first eight months of this year, at least 16 activists have been detained, arrested or sentenced under the country’s draconian Penal Code, including 6 members of the group, Brotherhood for Democracy, who could face the maximum sentence of death for their peaceful human rights work. Two female activists, Nguyen Ngoc Nhu Quynh and Tran Thi Nga, have been sentenced to 10 and 9 years in prison, for peacefully criticizing the government and have been subjected to dire prison conditions. I am also here with Ms. Le Thi Minh Ha, wife of Anh Ba Sam – Nguyen Huu Vinh who was sentenced to 5 years for simply blogging against the Government. There are, in fact, hundreds of prisoners of conscience in Vietnam right now, yet Vietnam fails to acknowledge their existence. Mr. Vice President, we call on the Vietnamese government to implement in good faith the UPR recommendations it accepted in 2014 as well as those made by Special Procedures and Treaty Bodies. We call on the UN Member States to urge Vietnam to free all prisoners of conscience. CIVICUS presents this statement together with VOICE.